What’s Cooking at the Chefs’ Gala? 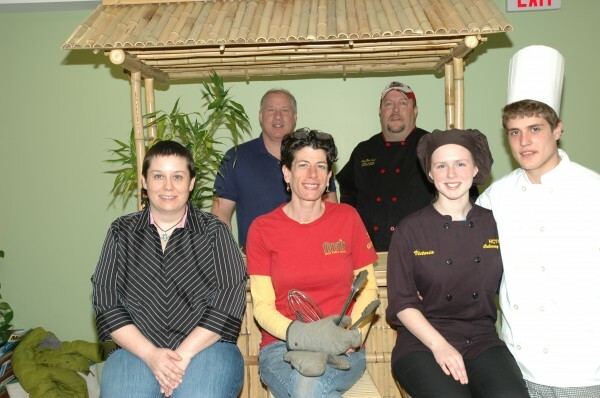 Front row l-r: Vanessa Young (Cookie Nook Bakery), Lorena Sterns (Finns’ Irish Pub) Victoria Grindle and Robert Colson (HCTC), back row l –r: Chip Butterwick (Chipper’s) and Alex Grant (Big Cat Catering). Other chefs who will be featuring some Havana Nights delicacies include The Crocker House, Cleonice, Havana, Yu, Nostrano and Morton’s Moo. ELLSWORTH, Maine — Cuban pulled pork with Guava pineapple and mojito chicken with lime glaze were just two of the items discussed as some of the local Chefs gathered to plan some tempting delights for the Chefs’ Gala guests on April 27, at the Ellsworth Ramada. Along with the amazing food, this year’s Gala will feature a live auction of Red Sox and New England Patriot tickets along with airline tickets all to benefit the MCMH Breast Clinic and Mammogram Scholarships. WLBZ2 has produced a Twenty Years of Chefs ‘ Galas video that will be aired and the ever popular Tony Boffa Band, underwritten by Darling’s Auto Mall and Darling’s Chevrolet, will supply the live dance music. The décor will be sure to please as Atlantic Landscape has provided the decorations and Witham Family Properties will provide the tropical flower sponsorship for this Havana Nights get away. We wish to recognize our local chefs who over the years have donated their time and expertise to cook their specialty dishes for guests of our Chefs’ Gala. This has resulted in over half a million in net dollars for our Breast Clinic enabling our hospital to have the latest technology for our community. A limited number of tickets are still available by calling 664-5548 or online at www.mainehospital.org.